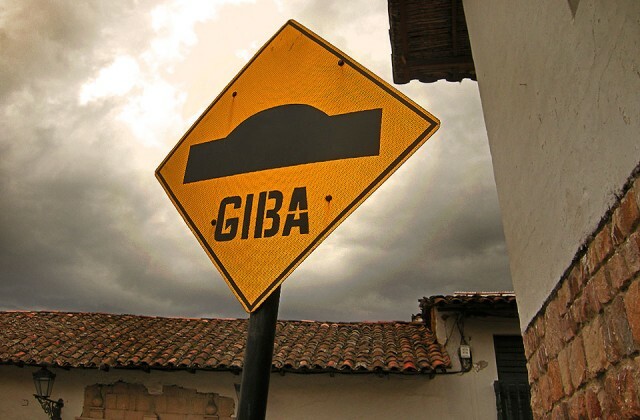 The seldom-used “official” name for a speed bump in Spanish. I’ve put this one off long enough. 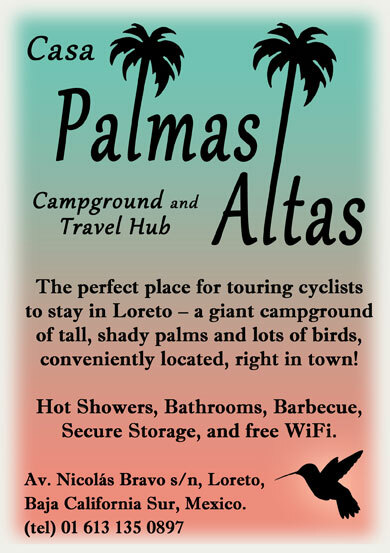 Of all the concerns we’ve addressed in El Pedalero there is one critical issue that remains unexplored. That’s right. We need to talk about speed bumps. What do they look like? What hazards might they pose for cyclists? But first, what are they called? 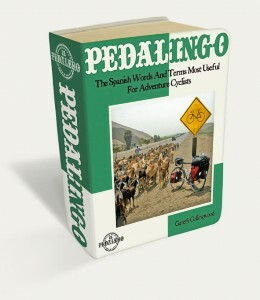 Cycling through Latin America means constantly adjusting your vocabulary to accommodate local words and terms. Oh, and by the way, you should avoid both papaya and lechosa in Cuba. Cubans prefer fruta bomba (bomb fruit) as papaya has a vulgar anatomical connotation in that country. Oddly, the most inconsistent term you’ll encounter is the various forms of what we would call a speed bump. 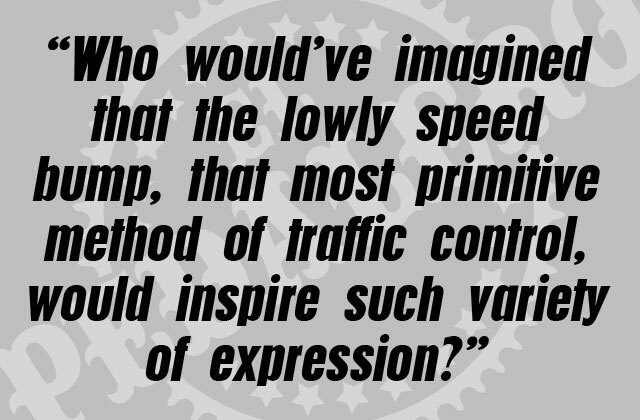 Who would’ve imagined that the lowly speed bump, that most primitive method of traffic control, would inspire such variety of expression? 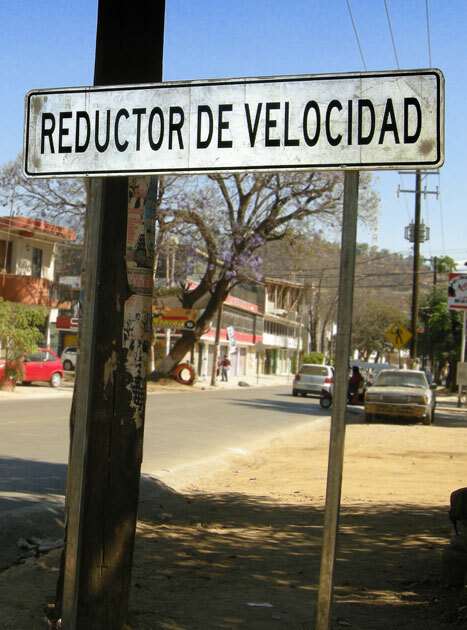 Officially, it’s known as a reductor de velocidad, or speed reducer; a term which itself is often reduced to simply, reductor – though you’ll rarely see either term on a road sign. Lying down on the job. 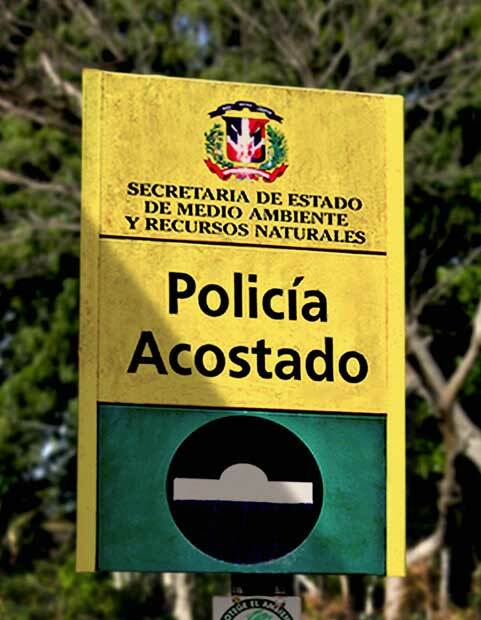 A sign for a speed bump in the Dominican Republic. 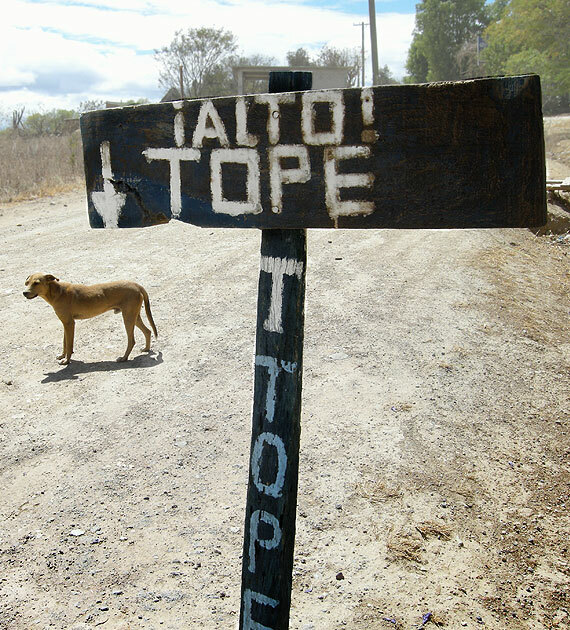 In Mexico, tope (limit), is the most common term. Argentina prefers lomo de burro (donkey’s back). 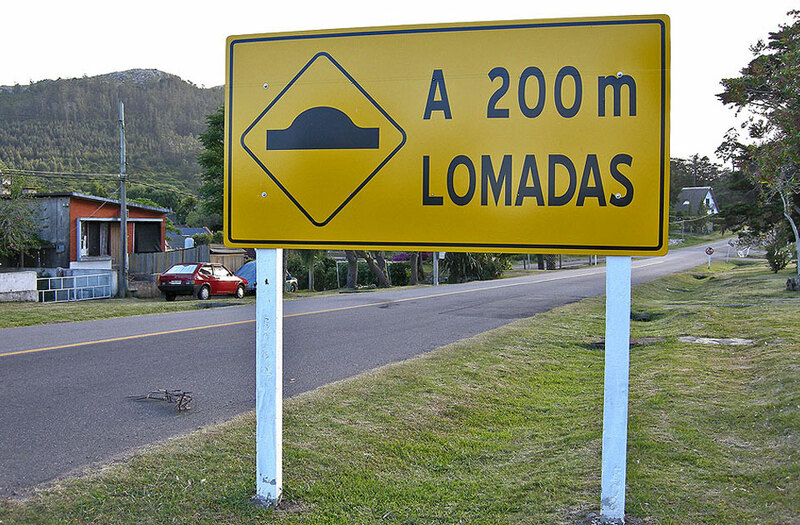 In Uruguay, it’s a lomada (small hill). The sinister, túmulo (burial mound), is the preferred term in El Salvador, Guatemala, and Honduras. Several countries call them policías muertos (dead policemen), or policías acostados (lying down policemen), or policías durmiendos (sleeping policemen). This list is long (see below for the complete inventory). Latin America’s speed bumps are not only varied in name, but also in form. Their more prototypal speed bumps will look familiar to most of us – semicircular, concrete, about a foot wide, and spanning the road at right angles. These may be cycled over slowly or ridden around if there’s room. 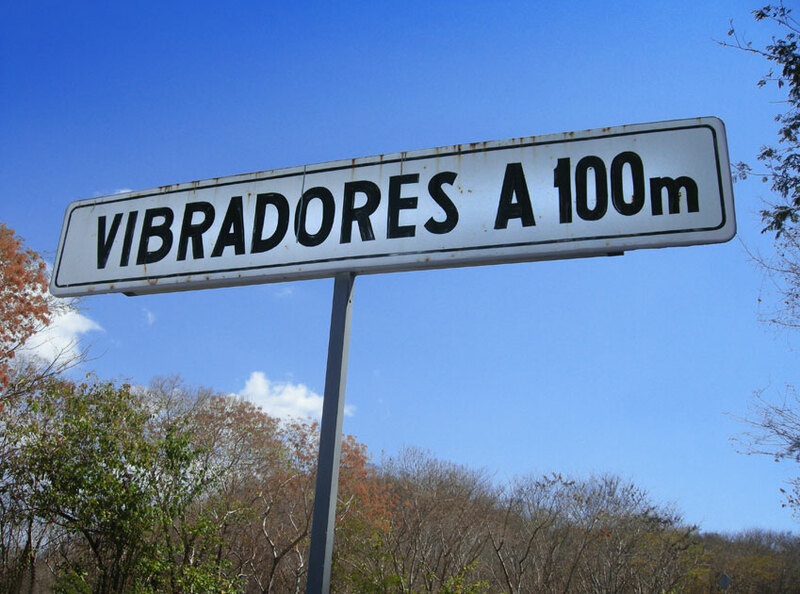 100m vibrators? … Oh, never mind. In coastal areas especially, speed bumps are often nothing more than a length of thick nautical rope pegged into the dirt at either side of the road. Sounds innocent, but the axle-cracking wallop caused by these makeshift speed bumps is surprising. Go around where possible. A despertador (which also means alarm clock) is a cross between a speed bump and a rumble strip, and more annoying than either. It comprises three mini speed bumps in a row that cross the shoulder but not the road. In a reversal of the usual scenario, cyclists are the ones inclined to swerve around them into traffic. 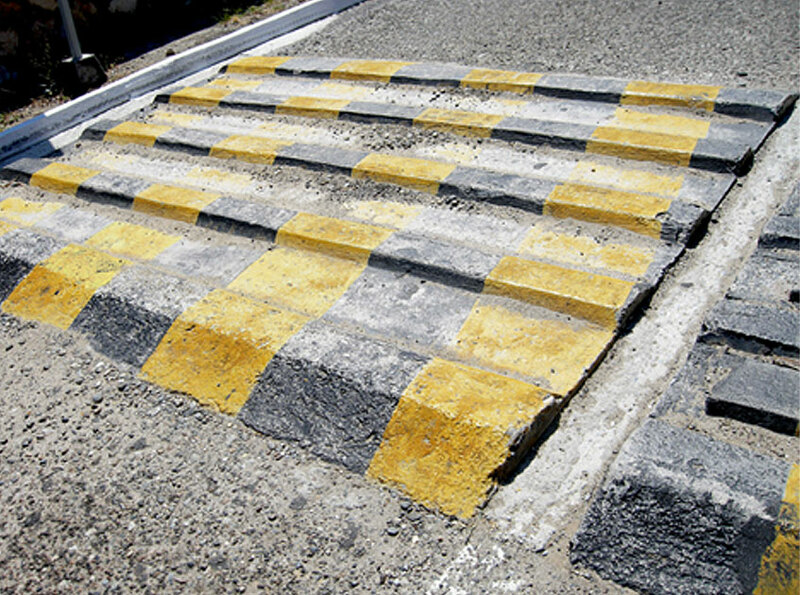 The reverse of the speed bump is the badén, a dip or ditch that slows drivers. 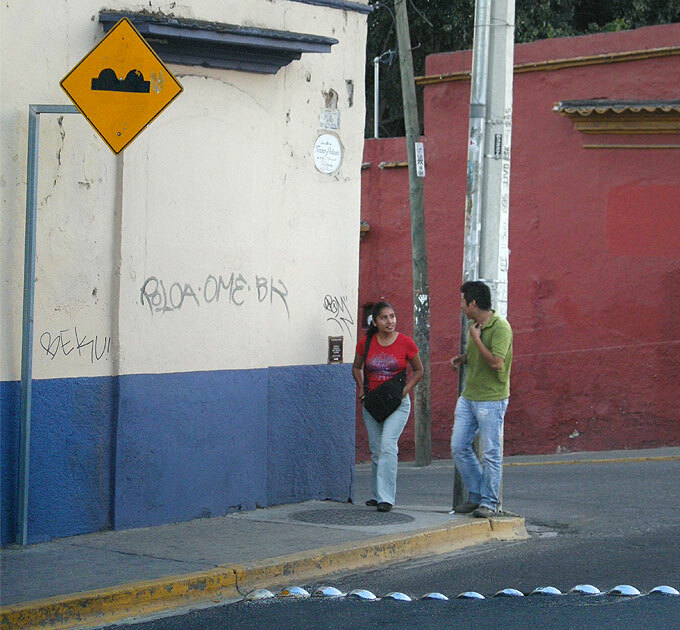 Those wide, modern-looking, ramp-style speed bumps (often with a raised crosswalk on top) that are becoming commonplace in North America and elsewhere have yet to make much of a showing in Latin America. They do exist, however. Small hills on the horizon and on the road. I rode over this “lomada” (which also means, small hill) in Uruguay. RIDE OVER? OR RIDE AROUND? While I’ve often been grateful for the traffic-calming effect of speed bumps, at times it seems they cause more accidents than they prevent. Drivers will swerve around them at full speed when they think they can get away with it. If a dog, or a chicken, or a cyclist, or even a small child is in the way, well, you can imagine. Another problem is speed bumps that appear without warning (most come with adequate signage, but not all). 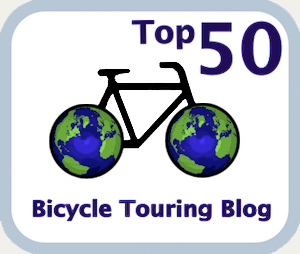 Hitting one at full speed on a loaded touring bike can seriously damage both bike and body. Despertadores (those three-mini-bumps-in-a-row types) are nastier than they look. I made the mistake of riding over one in Uruguay and everything bounced out of my handlebar bag. It’s best to shoulder check and ride around these. Finally, be careful with badenes or any ditch-style speed bumps. Some of them span the road diagonally, steering your front wheel in the wrong direction. And they often double as a water channel in rainy season. A water-filled badén may be deeper than you think. My preference is to ride around any kind of reductor whenever I can. If there’s no room to ride around, I’ll ride over slowly. Dismounting and walking over would be a last resort, but sometimes it’s the only way. Below is a list of terms for speed bumps in Latin America. If you’ve encountered a term not on this list, leave a comment below (bonus points if you add a photo and where you took it).